Craig Sarich with a Steve Jobs tribute design tattooed on his arm. Nothing grants a person supreme being status like a tattoo. After all, the ink is permanent. So even if the late Steve Jobs had a well-established legacy as the father of personal computing, some Apple fans felt the need to wear their devotion more deeply. Especially after the Apple founder’s passing in 2011, tattoo artists were asked to ink Jobs quotes or his face on forearms, biceps, and calves. Most popular was a likeness of the iconic Albert Watson portrait, the sitter with his left hand gently resting on his chin as he gazes intensely into the lens. Others chose Jobs quotes, like “Stay hungry. Stay foolish,” for guiding inspiration. “I’ve seen tons of Jobs/Apple tattoos, especially tattoos done really well,” says Marisa Kakoulas, a heavily tattooed author and publisher of the blog, Needles and Sins. 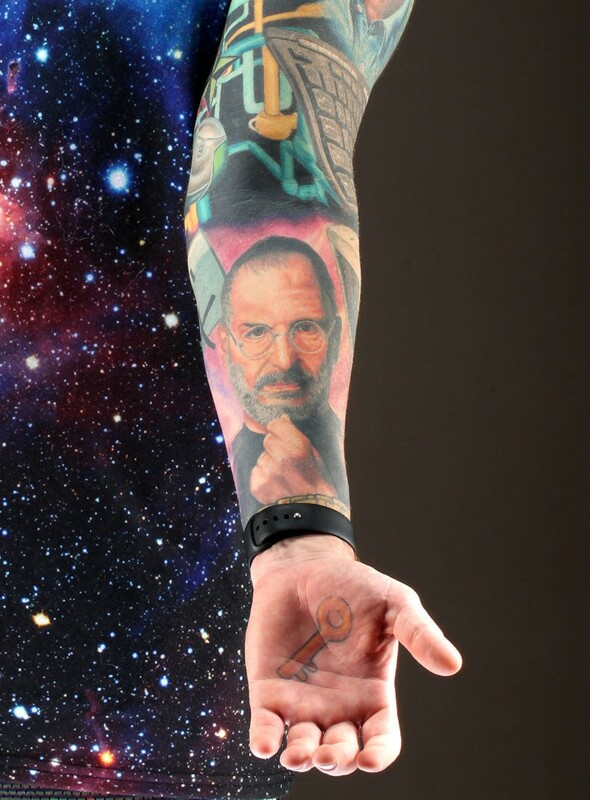 “It’s almost like high design of Apple translates in those tattoo tributes. 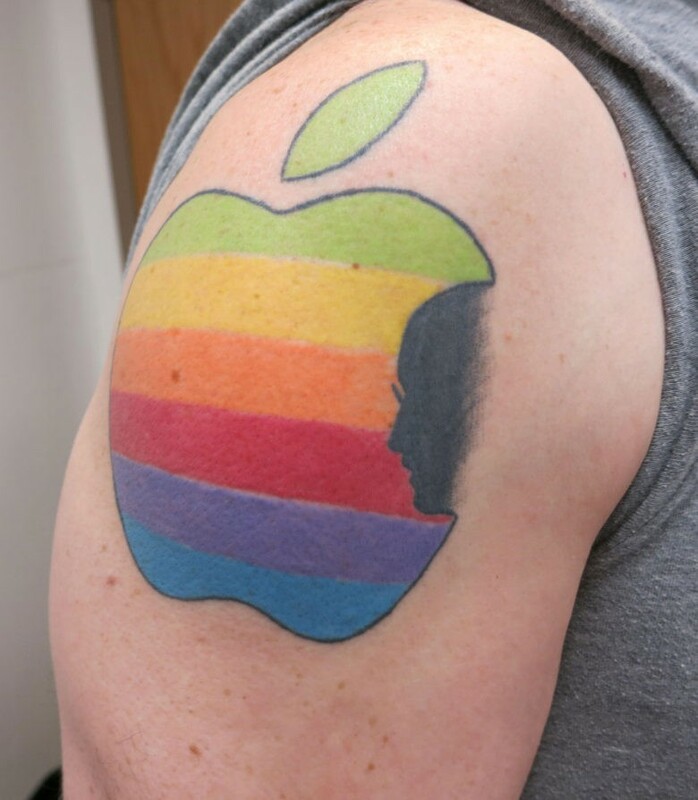 Dozens of Apple-inspired tattoos can be found across the internet. Cult of Mac identified four unique and distinctive designs and tracked down the bearers. While each has a different story, the four shared similar reasons for waking up every day to Jobs’ face: Each wanted to be reminded to be creative in their thinking and bold with life choices. Blake Patterson is a web developer today in no small part thanks to Apple and Jobs. His first taste of computer science in school with the Apple IIc, but the high-resolution Macintosh in 1984 blew his mind and steered him into a life entertained with technology. A pixel portrait of Jobs designed by former Apple icon and font artist Susan Kare. Patterson, 43, of Alexandria, Va., who went on to be an early developer of the Mac Rumors website and now co-owns Touch Arcade, saddened when Jobs passed in 2011 and knew he wanted to make a lasting tribute. As an ode to that first Macintosh, Patterson settled on a pixel portrait of a young Jobs designed by Susan Kare, an early Apple designer who created the early fonts and icons that remain imprinted on the consciousness of the typical Apple fan. 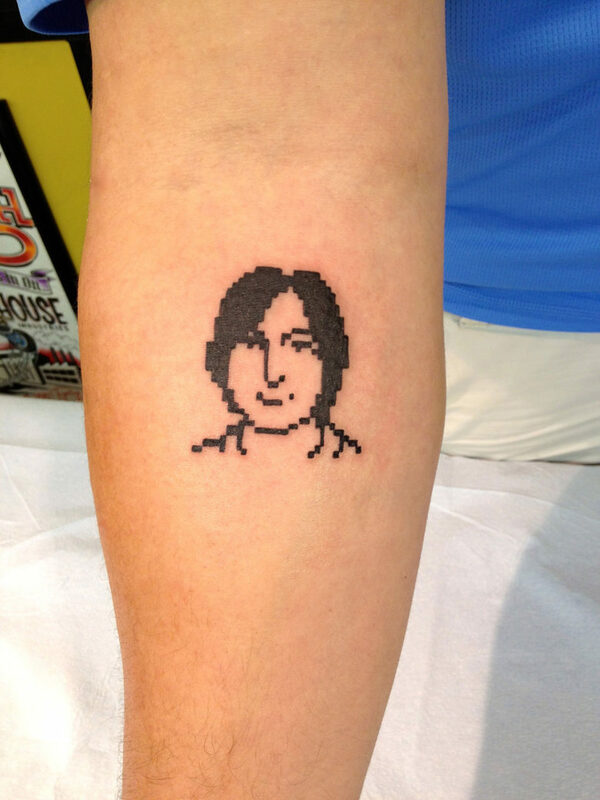 The young, pixeled Jobs covers two and a half square inches on Patterson’s skin. He sent a picture of the tattoo to Kare, who reportedly incorporated it in her presentations to design classes and other audiences. iDan, as he is known on Twitter, didn’t care friends thought he was crazy when he showed up to band practice sporting a black and white, richly graphic face of Steve Jobs on his arm. iDan settled on the Albert Watson portrait because the gaze in the photo reminded iDan that Jobs was a “modern day pirate.” He was tatted by artist Ted Mendoza of Coral Springs, Fla.
iDan may have been one of the first to get a Jobs tattoo. This was inked six months before Jobs passed. 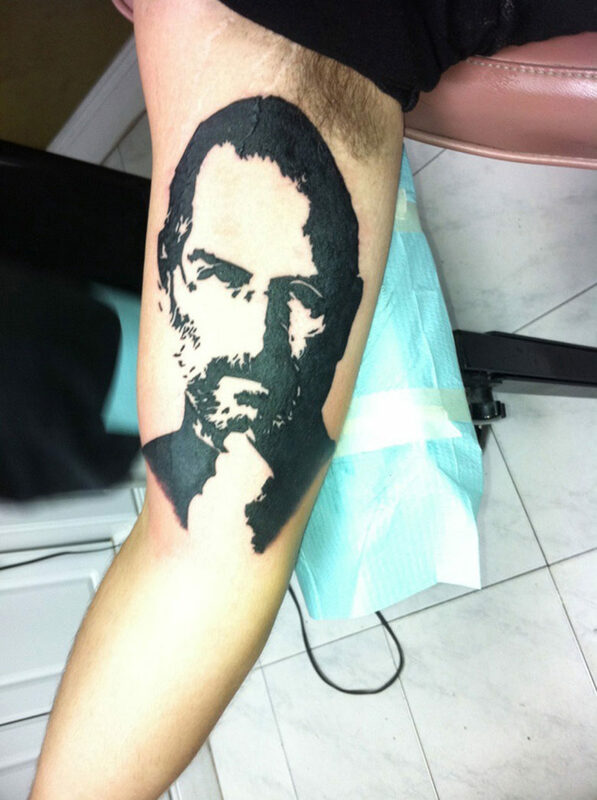 iDan worked for Apple while Jobs was alive and may have been one of the first to get a tattoo of him, the ink being applied six months before his passing. While they worked in the same building, he never got to meet his hero. Inspired by Jobs and his daring to dream, iDan eventually left Apple to tour with his band, and while in Vancouver got the news of Jobs passing. He cried and went to an Apple Store to be with other Apple fans. He wrote a song called “The Crazy Ones” as an ode to Jobs and though his band got opening gigs for acts like Ozzy Osbourne and Hoobastank, the record label dropped his band. He now manages bands and has a job that precludes him from using his full name. By the time computer store owner Kenny Pollock runs out of blank skin, his tattoos will be an inked history of technology and its leaders. Pollock’s tattoo of Jobs by artist Darian Lisker in Hollywood, Fla., adds color to Watson’s iconic black-and-white image of the Apple co-founder. 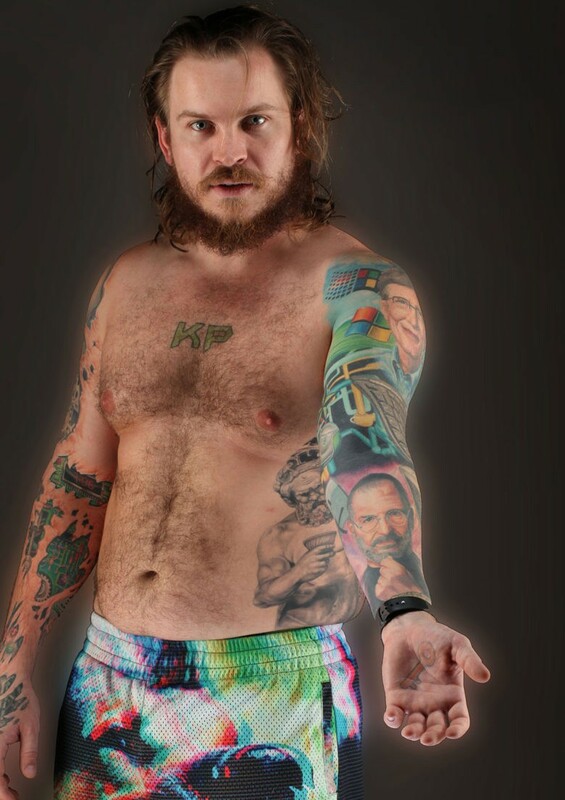 The story of technology is being painted on the body of Kenny Pollock. Pollock’s tattoo was inspired by the famous Albert Watson photo of Jobs. Elsewhere on his arm, Pollock has the Apple logo, the Finder logo, and a smaller portrait of Microsoft founder Bill Gates. He has a pec reserved for Tesla and Space X founder Elon Musk. Pollock says he has been on a computer since the age of 2, and has dedicated his life to fixing them. He had trouble with school and the computer was the only thing that kept his attention. He learned to read on one and if he focused on his classwork, he could earn computer time. Soon other teachers called on him to help troubleshoot their tech issues. He gravitated towards Macs for their simplicity, and so the ink on his body that tells the technology story is really as much Pollock’s story. Pollock often wears a tank-top shirt in sunny Florida and is used to heads turning to catch a glimpse of his brightly colored tattoos. The artist Lisker and Pollock won ‘best sleeve’ at a recent tattoo convention. He is planning to give the right arm a robotic design, complete with gears, wires and circuit boards. Craig Sarich, an MBA student and senior analytics analyst for a paper products company, did not understand the fuss about Apple until he got his first iPod and then an iPad. Soon a fever set in and soon he had iPhones, iMacs, AirBooks, and now he is going back in time by acquiring and refurbishing vintage Apple hardware. Craig Sarich proudly shows his tribute to Jobs. The more time he spent with his device, the more he came to understand Jobs’ unique genius. High on his left arm is the rainbow Apple icon with Jobs’ silhouetted profile in the bite of the Apple. This tribute design went viral shortly the day after Jobs passed and was created by Hong Kong design student Jonathan Mak Long. Sarich, of LaGrange, NY, said the Jobs tattoo makes him easy pickings for reporters covering Apple’s new product rollouts at its stores. 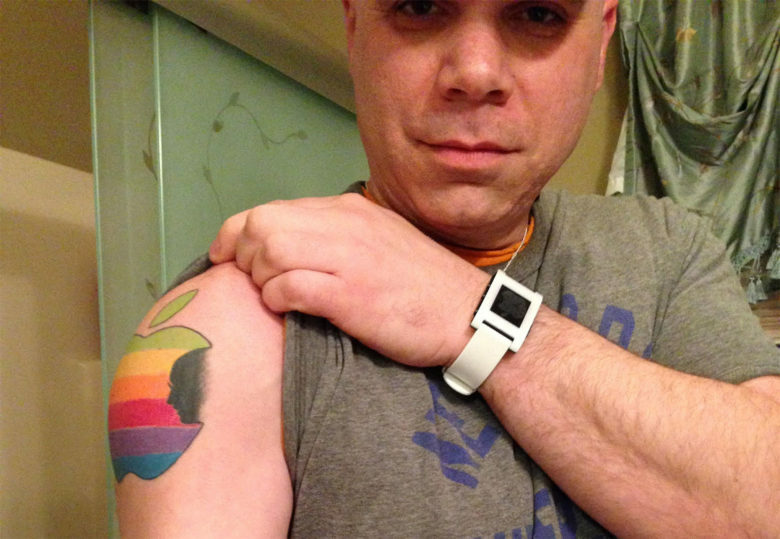 He also gladly poses with Apple fans who want a picture with the tattoo.